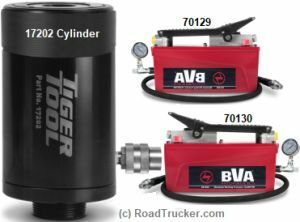 The 70129 BVA Hydraulic Pump delivers the performance and quality of a more cost effective solution. With a lightweight and corrosion resistant high strength reinforced alloy reservoir provides longer service and greater portability. Designed to be used with single acting cylinders and provides dust cover protection for the release control valve. The 17202 is the cylinder used in 15000 kit and 10705 puller and it generates 20 tons of power. The hydraulic cylinder on its own can replace the need for the 15000 kit when used together with the 15040, 15041, 15050 and 15060 adapter kits. All other adapter kits require the use of the complete 15000 kit. The 70126 & 70128 Hydraulic Pump delivers high oil flow for increased productivity and precise user control. It includes hose and gauge. Designed for efficiency and comfort in the working environment for less operator fatigue. Closed hydraulic system prevents contamination and allows pump usage in any position. Standard Products are warranted for so long as they are owned by the first using purchaser.